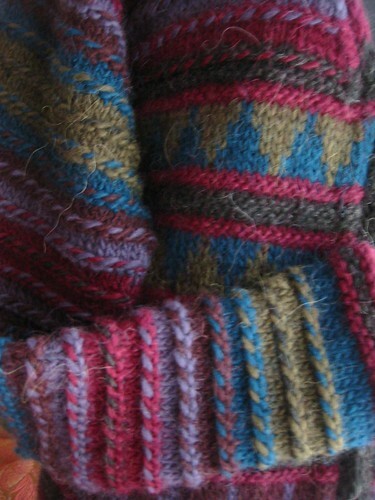 Folk Style Kaftan Detail, originally uploaded by modeknit. So tonight is the big finale! Some folks have asked how I can see this show when I don’t have cable – it’s through the internets… I have a mac, but I think you can use iTunes if you’re on a PC, too. Choose TV Show in the pulldown menu. This is how you can buy either one episode or the whole season. I think you’ll have to download iTunes, but it’s a free download for Mac or Windows. NOTE: They don’t put up the new show until the day after it airs. But sometimes Tim’s podcast goes up right after the show, and that’s almost MORE fun than the show! To find the podcast do the same search above, but choose “podcast” in the pulldown bar. It’s the selection with a picture of Heidi. … and, we have a bite on the house. Can we move by Jan 1?